InShape News Q ‘n’ A – Kale Fad or Fashionable Fitness Food? Kale was one of the most common green vegetables in Europe up until the Middle Ages when it fell out of favour. After a recent introduction to America and Asia-Pacific, kale was grown for the beauty of its curly leaves. These added much-needed decoration for salad bars all over the world. Its resurgence in popularity for ingestion and nutrition is relatively recent. Kale is a green leaf annual or biennial vegetable, similar to cabbage, but a variety that doesn’t form a ‘head’. It’s from the family Brassica oleracea, reaching heights of 6 or 7 feet, but is generally known for its high fibre content. It has a number of different varieties with either flat, curly, or bumpy leaves, or the ornamental variety that varies in colour but is not as palatable. Why has a Kale Fad Emerged? Eve Turrow of MindBodyGreen did a deep dive into the creation of the cult status of the kale fad. Her fascinating kale article, a product of weeks of research, reveals that kale’s rise to stardom was actually a brilliant PR campaign of Oberon Sinclair, founder of My Young Auntie PR, masquerading as the American Kale Association (which isn’t real). That campaign produced a worldwide phenomenon that puts production pressure on farmers, downward pressure on prices, and plenty of kale on everyone’s plates, all of which is good for the consumer. Hype Aside, is Kale Good for You? Kale, like most vegetables, is good for you. WHFoods.com lists a range of amazing health benefits, as does Helen Nichols of Well-BeingSecrets.com who lists 23 science-backed benefits including an aid for depression, diabetes, cancer, heart disease, obesity, as well as eye, heart, bone, skin and hair health – common with many other cruciferous vegetables. One reason that kale is promoted over its cruciferous compatriots, apart from the marketing, is that it has been far more heavily researched than say broccoli or cabbage. What’s the Nutrient Value of Kale? One hundred grams of raw kale yields 84% water, 9% carbohydrates, 4% protein, and 1% fat. According to Wikipedia it also contains a large amount of vitamin K: several times the Daily Value (DV). It is a rich source (20% or more of the DV) of vitamin A, vitamin C, vitamin B6, folate, and manganese (see table “Kale, raw”). Kale is a good source (10–19% DV) of thiamin, riboflavin, pantothenic acid, vitamin E and several dietary minerals, including iron, calcium, potassium, and phosphorus. Kale is also a good source of the carotenoids lutein and zeaxanthin, as well as glucosinolate compounds such as glucoraphanin, which contributes to the formation of sulforaphane, a compound under preliminary research for its potential to affect human health. Obviously cooking kale diminishes these benefits. What Makes Kale Better Than Spinach or Broccoli? Kale is one of the most nutrient-dense plants on the planet for its calorie count, according to Kris Gunnars, Bsc. It’s also high in antioxidants, which is why it’s often turned into a superfood-style powder. And whilst these powders can have their place as part of a busy modern lifestyle, they do contain fewer nutrients than the real thing due to nutrient loss during processing. It is difficult to compare the nutritional content of kale, versus broccoli or spinach (from the chard family) due articles reporting different values for different weights with some reporting raw values and others cooked. Fortunately, NutritionalValue.org gives you the low down. The site shows raw kale has more than twice the calories of spinach, but half the sodium; and 47% more protein and niacin. Spinach is 37% higher in folate than kale; 48% more lutein and zeaxanthin; and a whopping 68% more phosphorous. Broccoli seems to have less of every nutrient than the others, with the exception of selenium, which is crucial for thyroid function. Interestingly broccoli has almost three times the selenium content of kale and spinach. So is Kale a Superfood? The term ‘superfood’ is actually a marketing term created to promote products. There is no strict definition and the term is open to wide interpretation and misuse. For more information read my previous article “Superfoods: Fact or Fiction”. It is important to remember any vegetable in its raw form is packed with nutrients, vitamins and minerals. Thus, it’s exceptionally good for you – including kale. But, rather than following the latest ‘Superfood’ trend and over indulging, eat less. Otherwise, you may overindulge. In fact, eat a diet rich in raw natural ingredients and low in processed foods. Following the kale fad or any other fads is not good. Some people find kale bitter and others don’t. This is because different classes of phytochemicals in varieties of kale (alkanoids, phenols, terpenoids, alkaloids, flavonoids, glucosinolates and isothiocyanates) can trigger a bitter taste. Further, the ‘bitter’ phenomenon of green leafy vegetables (including Brussels sprouts) may have a genetic link. Compound Interest’s Andy Brunning explains that some people are especially sensitive to naturally occurring chemical compounds called glucosinolates, which are broken down into isothiocyanates when cooked, and which taste bitter to around 70% of people. How Do I Get the Bitter Taste Out of Kale? If you’re worried you have the ‘bitter gene’ and can’t eat kale, think again. Stephanie Eckelkamp reports that salting, roasting and all can all help to block the bitter taste. Christine Gallery adds acid, braises or adds strong-flavoured ingredients to mask bitterness. But Chef Cary Neff, author of “Conscious Cuisine”, explains the best way to remove the bitter taste is by blanching the kale before use. How do I blanche kale? Wash your kale and cut the stems off. Fold your kale in halves or thirds and push the kale firmly into a pot that they barely fit in. Fill the pot 1/3 with water and bring to the boil. Reduce to a simmer and let cook for up to 20 minutes, occasionally stirring. Drain the kale, and wash or plunge in cold water to prevent further cooking. How Much Kale Should I Eat Per Day? Eat as much kale as you like without going overboard, especially when it’s raw. Packed with fibre, raw kale fills you up quickly and keeps you fuller for longer. Having said that too much of any good thing is a bad thing. And there is such a thing as eating too much kale. Fast Company’s Jessica Leber reports kale fails can include low-level poisoning of the toxic heavy metal thallium even from organic kale, however, this is very unusual and medically unproven. Other than eating large amounts of leafy green vegetables leading to gas, bloating, and constipation, the main danger is for those on beta-blockers, blood thinners or who are prone to DVT and clotting. Kale contains a high amount of vitamin K, which aids blood clotting. If this is an issue then switch to other vegetables. Kale also contains oxalates, which are substances sometimes linked to kidney stones and gallstones. It also affects those with lower kidney functioning. Those with kidney conditions should instead eat a low-oxalate diet. What are the Best Kale Fad and Fitness Food Recipes? Recommendations are always the best. So, look for recipe sites that include user ratings to determine whether a recipe is good or not. Here’s a smattering of recipes I found to tempt even the fussiest tastebuds. BBCgoodFood.com lists 34 kale fad and fitness food recipes, of which the most highly rated are Kale Tabbouleh, Spicy Clam and Kale Linguine, Kale Pesto, Kale Salsa, and Chicken, Kale and Mushroom Pot Pie which looks completely delicious. GoodHousekeeping.com has a lovely slide gallery of 16 kale fad and fitness food recipes linking to blog sites featuring recipes like Kale Pesto Pizza, Sweet Potato Kale and Quinoa Fritters and Kale Slaw, great speedy share plate recipes for impromptu gatherings. JamieOliver.com claims to have eight killer kale fad and fitness food recipes like Sesame-Roasted Kale, Super Noodle Ramen With Kale and Barbeque Mushrooms, and Kale And Ricotta Omelette perfect for any time of day. Finally Meghan Telpener has put together 8 Kale fad and fitness food Chip flavour recipes almost guaranteed to obscure even the most bitter tasting kale, with oven and dehydrator options, as well as a number of tips to ensure your chips get really crunchy. Sigrid de Castella is an internationally published author, speaker, and coach in the fields of health and business. 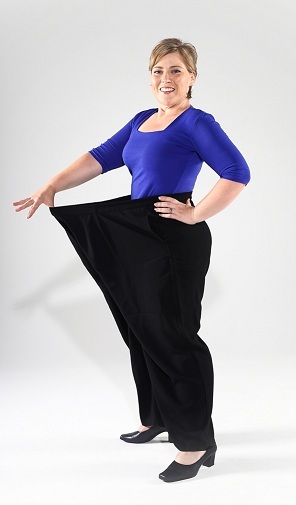 Her book “Half The Woman I Was – How I lost 70kg naturally, reclaimed my life … and how you can too!” has received international acclaim and is hailed as the most comprehensive weight loss book on the market. Sigrid studied Personal Training with the Fitness Institute Australia and has a keen interest in whole food nutrition. She also is interested in natural therapies and physical and mental health. Sigrid and holds a BBA from RMIT University and is a member of both the Australian Institute of Managers and the Australian Society of Authors. Disclaimer: The information published in this column is based on each of the author’s personal knowledge and opinion. This information and opinion is not a substitute for professional medical advice, diagnosis or treatment of any manner. Always seek the advice of your physician or another qualified health provider with any questions regarding any medical condition. Also, consult a qualified medical professional before beginning any nutritional or exercise program. Never disregard professional medical advice or delay in seeking it because of something you have read on InShape News.